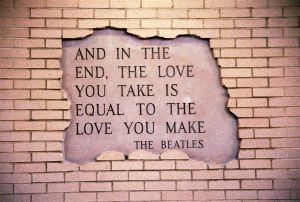 “All You Need is Love…All You Need is Love….All You Need is Love…Love. Love is All You Need.” NOT. Love is more than just a need and more than the answer to what you need. Love is an action and a choice. The feeling of being in love is powerful and intoxicating. The act of creating a Great Love and nurturing and growing that with another person is not nearly as much fun, but in the end is much more powerful. Choosing to love someone during feelings of “unlovedness” (yes I make up words) is one of the hardest tests there is and the most relevant one too. See, Love is what you do when you don’t feel like doing it right now, but you do it anyway. Love is a knowing that comes over you, through you and solidifies in you about your commitment and caring for another person; no matter what. It doesn’t happen right away, there is not deep love at “first sight” (although the chemistry might try to argue that point). Deep, true, Great Love, is an action that is chosen at life’s toughest moments. It does not happen in complacency, it is not a “giving up” of your own self, dreams, desires or preferences for the sake of another. It is an opportunity to expand yourself into the personal, intimate and often times uncomfortably strange space of another person; vulnerably and consciously. Whoa. That is big stuff. Once the excitement of the newness of love wears off, there is actually nothing overly stimulating about Great Love. For couples who have not bought the fairytale version of love and instead are taking on the opportunity to expand themselves and their partners through Love, they find the post-honeymoon era to be much more honest, strong, grounded, and real then they may have thought it could be. Being tied to the fantasy of another person being your “everything” can keep you from actually enjoying the beauty and growth of what Great Love is. It is a much fuller, deeper way of connecting to each other and to ourselves that includes a knowing and trust of commitment. It is a choice from each partner to the other to be willing to be unselfish and make acting loving towards each other a purposeful choice, even when you don’t really feel loving. This is proof of love. Words mean very little. Action is everything. One of the most common comments I have received when working with clients who have “fallen out” of love, is that they no longer feel compelled to be in positive action with each other. The “falling out” includes a “giving up”. It creates a complacency towards each other and towards Love itself. Separating and living apart while still living together is inaction towards Love. When the effort feels too great, your Love is in danger. The sad fact is that many relationships end because of the false belief that Love is a feeling and once the feeling subsides then Love no longer exists. Their experience of Love doesn’t match the cultural expectation that they have been shown. Happily ever after doesn’t exist. Happy moments and period of time and a great effort to care for each other when we don’t feel loving is creates an ever after together. The expectation of Love being all we need and that we need to be happy all the time is what keeps us doubting our love, ourselves and keeps us focused on what we think is broken instead of what is possible. Isn’t it time we look at our expectations of Love, embrace our humanity and allow our partners and our selves to become our best versions of ourselves by expanding our capacity to love? This is how the healthiest relationships are supported and last the test of time. Love isn’t all you need. Love needs you to take action.